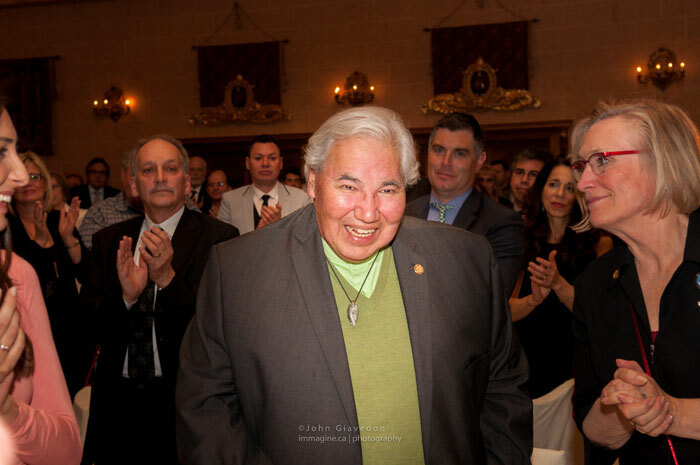 At the 9th annual Duff Roblin Award Dinner on Tuesday, November 17, 2015, The Honourable Mr. Justice Murray Sinclair, Chair of the Truth and Reconciliation Commission of Canada (TRC), delivered this powerful call to action when he accepted the 2015 Duff Roblin Award. Watch highlights from the dinner below. To watch the video of the entire event, click here. An event photo gallery is available here. More than 440 guests gathered at The Fort Garry Hotel, Spa and Conference Centre to honour Justice Sinclair, making it the most successful dinner in the event’s 9-year history. Over $100,000 was raised in support of the Duff Roblin Scholars Fund, Community Learning initiatives, and the Truth and Reconciliation Commission of Canada Scholarship Fund. In particular, you may wish to consider the 94 Calls to Action made by the TRC in order to redress the legacy of residential schools and advance Canadian reconciliation.